1. GOODREADS. Hands down Goodreads is my best blogging tool. I’m constantly keeping my lists updated with read/TBR/currently reading as well as ALLLL the genres a book applies to AND if it’s swoony, I got it from a pub/author or am reading it for SC. I also update my reading progress CONSTANTLY so I can always go back and reference my notes if I forget something for a review, need a quote, or want to see what someone else thought of the same part. I also link all my reviews back to Goodreads and use their synopses for the book summary in my review. I tried writing my own but that was SO exhausting because I already say so much in my reviews! Goodreads is the ULTIMATE blogging assist! 2. GOOGLE CALENDAR. I would be lost without Google Calendar. Okay, not lost. I used to just schedule my posts and I would go back and look at all my posts to see what went where. But when I started scheduling so many in advance, it started to get confusing between what was scheduled and what I had just saved as a draft. Google Calendar lets me COLOR CODE OOOOH. I obsessed about it so much that it even made an appearance on My Latest Bookish Addiction. 3. MY BLOGGING BESTIES. They constantly keep me in the know of new books, books I need to read, books I can pass on, and we’ve also started doing informal read alongs (in addition to our actual official read alongs that we’re already a part of) — They keep me on track and on my toes! 4. TWEETDECK. Thank goodness for Tweetdeck for when Alyssa and I do our #LitLush chats! I can easily switch from one account to another, see multiple panes at once, and easily follow things like mentions, hashtags, and my own tweets. It’s HEAVEN for Twitter chats. 5. INSTAGRAM. Instagram isn’t a necessary blogging thing, but I love following other bloggers & friends to see their blogging/book photos as well as keeping in touch with their daily lives too. I think Instagram makes it easy to keep your friends up-to-date quickly with all things under the sun, not just blogging, and it brings us happy bloggers together on a whole different level. 6. TWITTER. Well duh, I mentioned Tweedeck, but I did not mention Twitter. Nowadays I kind of feel like Twitter is almost a “must-have” for book bloggers. It’s such a great way to keep yourself in the know about books, participate in chats, catch up on posts, and interact with authors & publishers. I didn’t have Twitter for the first couple months I was blogging and then I quickly realized how much it helps promote your blog and keep you in touch with EVERYONE! 7. STATCOUNTER. I’m one of those people who is obsessed with their stats. How many views, where referrals came from, where people went, and what kind of things people were searching for when they landed on my blog. I’m kind of obsessed with checking the Statcounter stats (they’re also more accurate than Jetpack as far as page hits go). 8. GOOGLE DOCS. I use Google docs for TONS of things. Quick notes so I don’t have to carry a piece of paper, forms & spreadsheets for things like Literary Lushes or events that people sign up for, and even snippets of writing ideas that I can save to the internet and access anywhere versus just my laptop. It’s an awesome and easy way to share with other people too. It’s not as nice as Office, but the convenience of accessing it anywhere is well worth the use! 9. FREE TIME. Okay, this is stretching it but I can NEVER get enough free time. I tend to spread myself a little thin as far as blogging goes because I LOVE being a part of so many things, but that usually means I’m strapped for time. I try to finish one thing and immediately schedule a post so I don’t have to worry about finishing at the last minute and frequently I’ll have short bursts of time at work where I can quickly edit a post here and there, but free time for READING is always in need. Now that we’ve moved, I’m constantly running around, organizing the house, buying things for the house, and my drive to and from work is longer. Any time I can read, it is ALWAYS helpful. 10. PHOTOSHOP. I just have Photoshop Elements but it’s SUPER helpful for creating my own graphics. Sometimes I’m super proud of them and other times they’re really crappy, but it’s SO much better than using MS Paint like I used to do! It’s a little complicated at times and I don’t know all the tricks yet, but just having it at my fingertips really has helped turn my blog into something a lot nicer than it used to be! 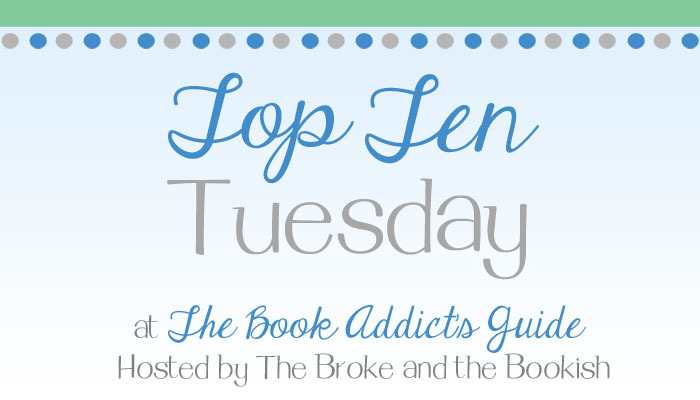 This entry was posted in Books, Top Ten Tuesday and tagged Books, top ten tuesday on August 20, 2013 by Brittany. I love Google Drive too. I use it for almost EVERYTHING blogging related! It’s just so handy to have that access, especially since I also have(and use quite often) the google drive app on my phone. I also really like using google docs for forms! I tried using google calendar, but I didn’t like having to constantly switch tabs, so I started using the WordPress Editorial Plug-in calendar instead. It’s simple, but gets the job done! I really should start trying to use Tweetdeck. I typically just use the web application, but I know tweetdeck has all these features & makes twitter better(so I’ve heard!). I think Goodreads is definitely on that should be on everybody’s list! I am glad you mentioned Tweetdeck. I am going to have to check it out since it has the multiple panes, that would help me during the chats immensely. I just found my photoshop elements 2 days ago while unpacking in the office! I have been moved in for a year now, but still unpacking and putting everything where it goes >.< Great list! My TTT. I love that Goodreads has been on so many blogs. How do bloggers cope without it?! Great list. StatCounter sounds dangerous! I finally just got over worrying about my stats! I love all of Google’s features… they are super great when it comes to blogging! If only I liked Blogger… haha! I would love to get Photoshop elements and play with that more, as I think I could do a lot that I can’t do in online photo editors. And I love that you are obsessed with stats! I try not to pay attention to them, and sometimes I forget to check them, but there are weeks when I’m watching them like a hawk! Excellent list! I also love Google drive, it makes my writing life much easier. I do need to make better use of the calendar though. Ahhh good list. 🙂 I’m gunna check out statcounter. WordPress does a pretty good job, but I think it would be good to compare it to something else and see if there is any difference. I also like that it is invisible. I used to have sitemeter on mine, but it didn’t always work right and I didn’t like it being posted on the blog. I don’t take advantage of google calendar as much as I should. I didn’t even think about Instagram! I love creeping on everyone’s pics, especially when they are bookish in nature. I use so many of these as well, but my number one has to be MS OneNote. Goodreads is amazing and I love having Google calendar and docs accessible anywhere through my phone… but my OneNote file is sort of my one-stop shop for blog organization. I’m a Google calendar nerd and just never thought of planning posts that way…Brilliant! I’m going to try it now. And I completely agree with Goodreads. I used to be a Shelfari fan, but I just love the GR community so much more! I feel like you listed so many things I should be using, but I don’t! I used to use Tweetdeck, but my 4.5 year old computer doesn’t always like it. I really miss TweetChat, back when I had a personal blog and used to do a bunch of Twitter chats every week it was the best. I’ve been thinking about how I need a new way of keeping track of my stats so I’m going to try Statcounter, thank you! And Photoshop Elements, I know I should use it, but it’s just so intimidating and I always hate everything I do. I own photoshop but haven’t bothered to learn how to use it yet. I need to get going on it! Goodreads is literally the best invention on the face of the planet… ok… so maybe that’s a bit of an exaggeration, but it’s so helpful!!! Being able to make so many different lists is great! I love lists, and goodreads is amazing for lists. Blogging besties are a must too! What fun would blogging be without the people we share it with?! And I have photoshop… I am just very VERY limited in my skills… I seriously need to learn how to use it! How did I forget about Goodreads??!! Major facepalm!! lol. I really need to get photoshop or something. Right now, I just pay someone to make my graphics for me. I always like your graphics though! I think they are super cute! I’m with you on free time. This is the first summer in two years I haven’t taught, so I was able to redesign my blog, grow it a little bit, and even post on a semi-regular schedule. That all went to hell when I started school back! I’m trying to blog on Sundays now, but mostly I just want to nap.